Its sleek design makes it very discreet and you can use it at home, in the office and even in your car since it also works by USB. Practical and effective, you don’t need to pour your essential oils drop by drop into the diffuser before each use. The Lunelia diffuses by cold nebulisation, directly from the bottle of essential oils, protecting them and keeping their beneficial properties intact. The size of a soda can, it can be placed in the cup holder of your car for your journeys. 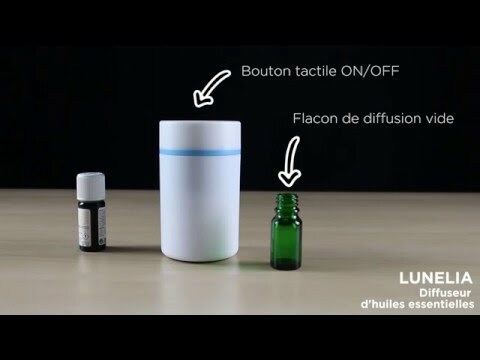 The Lunelia diffuses either continuously or alternately 10sec ""on"" and 20sec ""off"" – you choose. Thanks to its nebulisation technology, the micro-droplets are distributed across a room up to 40m² for several hours. The diffuser has two diffusion settings to adapt its use to the size of the room as you desire. For information, nebulisation is the action of spraying a liquid in micro-droplets through a nebuliser. The pump sends air into the glass container (the diffusion device). This air projects the essential oils against the glass. The nebuliser then creates a cloud of micro-droplets that disperse throughout the room. The principle of nebulisation is based on the Venturi technique. In the nebulisation chamber, a high-speed airflow sprays the essential oils stored in the base of the glass container in micro-droplets. The lighter micro-droplets will come out into the surrounding air via the cap. This cap has two functions: sound level reduction and diffusion axis. The largest drops fall back, to be sprayed again as micro-droplets. Remove the dropper from the essential oil bottle and screw to the diffusion nozzle. Assemble the whole thing to the base of the diffuser. Connect the power adapter to the diffuser with the AC outlet or USB. Press once to diffuse continuously. Press a second time to alternate 10sec ""on"" and 20sec ""off"". Press a third time to turn the diffuser off. Set the diffusion frequency over a chosen period and enjoy your essential oils without having to touch your diffuser.